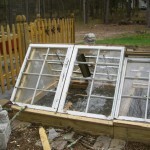 And these are the cold frames two days later. 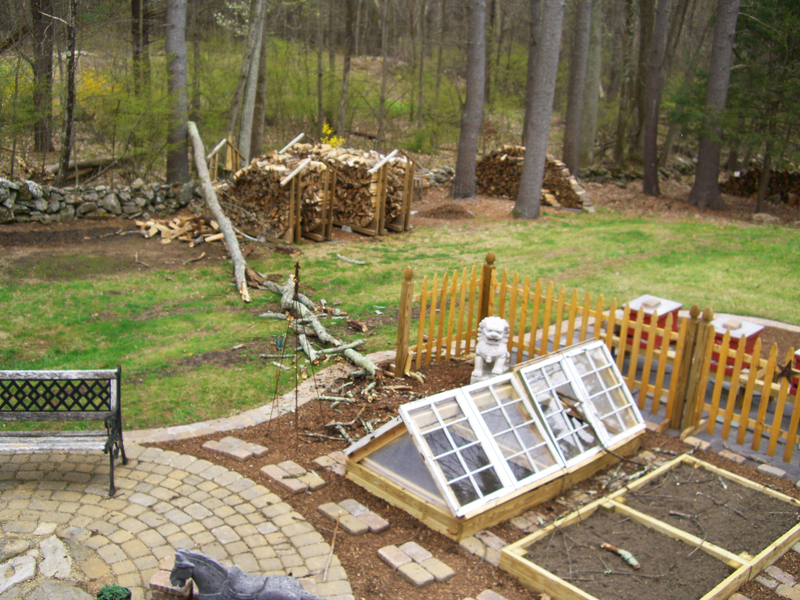 Lisa did not even get a chance to put plants in her new raised beds before we had a little bit of a windstorm and one of the NEIGHBOR’S trees fell on the cold frames. Not a single sash on the rear box escaped damage. 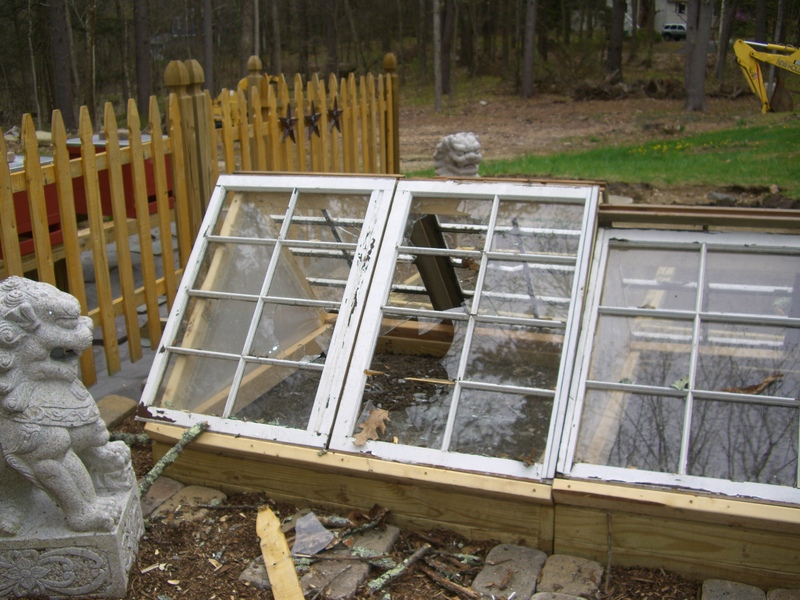 Panes were knocked out of all four sashes; both sides of the cold frame got hit. 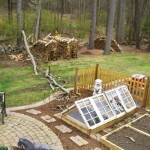 One picket in the bee screen was broken as well so it looks like I’ll be spending a little more time on the garden. With the April Showers tapering off, the end of Mud Season is here! The last couple of weekends have had a few other projects distracting me from my backhoe engine work. 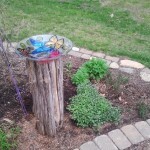 First up is a nice little birdbath made from an aromatic cedar log a friend gave Lisa. 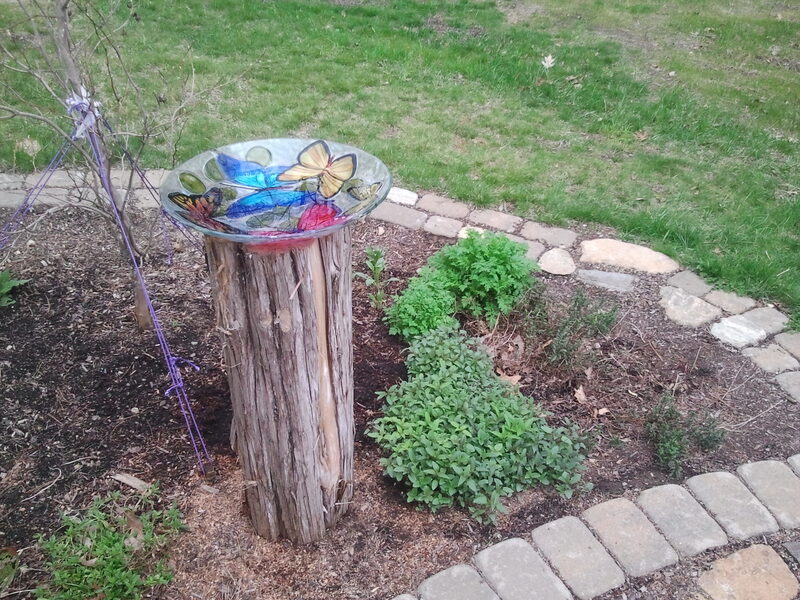 I chainsawed a slot up the side of the post, and cut a recess in the top so that when winter arrives, we can place one of the ugly, but integrally heated, plastic birdbaths on the post. For now, we’ll get to enjoy this whimsical glass butterfly bowl. I hope our birds and bees like it too. I built this garden shed over 3 weekends one November, taking advantage of the Thanksgiving holiday. It was a toss up for my wife whether she most wanted to take her kitchen with her, or this shed, when we moved! I had to promise her to build another just like it at our next house. I haven’t done that yet, but I’m betting she hasn’t forgotten the promise. 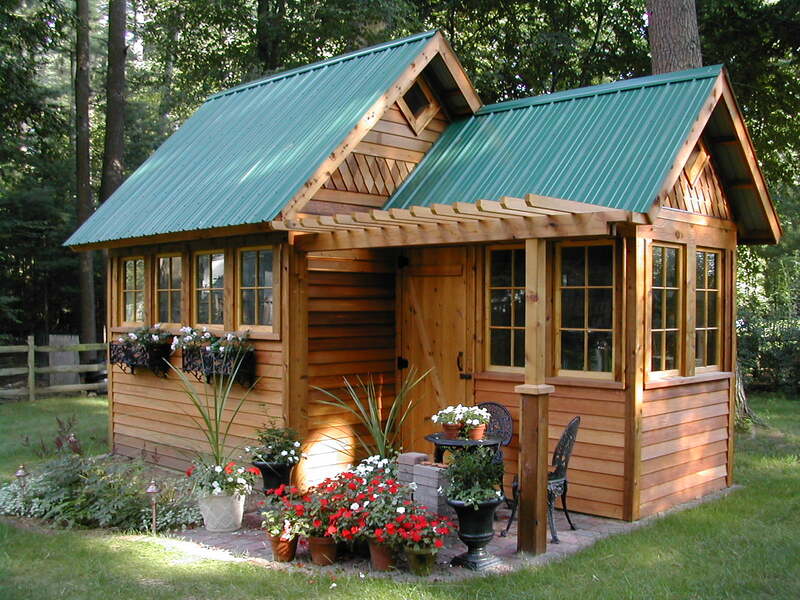 The shed is based on plans that appeared in The Family Handyman, Jul/Aug 2003. Plans are available online from Readers Digest. 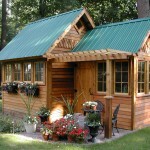 My shed differs from the plans with a larger storage area, and upgraded exterior finishes. Unfortunately I didn’t think to get any pictures of this under construction, which is too bad since it snowed right after I put in the foundation! These photos are from the following summer.